Mayor Michael Hancock recently said he was planning to revive an idea to charge a monthly fee for trash collection in Denver. DENVER — A trash collection program that would charge people based on how much garbage they throw away each month would incentivize people to change their behavior. That's according to Charlotte Pitt, interim director of Solid Waste Management, Denver's trash removal department. Pitt spoke to 9NEWS after Mayor Michael Hancock recently said at an elections forum that he was reviving a trash collection "pay-as-you-throw" idea he first discussed in 2011. Under a pay-as-you-throw trash collection program, residents choose a container size and are charged a monthly fee for trash to be collected from that container. Currently, Denver has a $25 million budget to pick up the approximately 171,000 tons the department collects each year. That money comes from the city's general fund, made up primarily of property and income tax. There is no direct charge for trash and recycling. The pay-as-you-throw idea is still in its infancy: There is no draft ordinance and Denver City Council would need to adopt it. Pitt said right now the city is doing background research. We asked Pitt to break down the program, why she thinks its a good idea and how it would work for Denver residents. 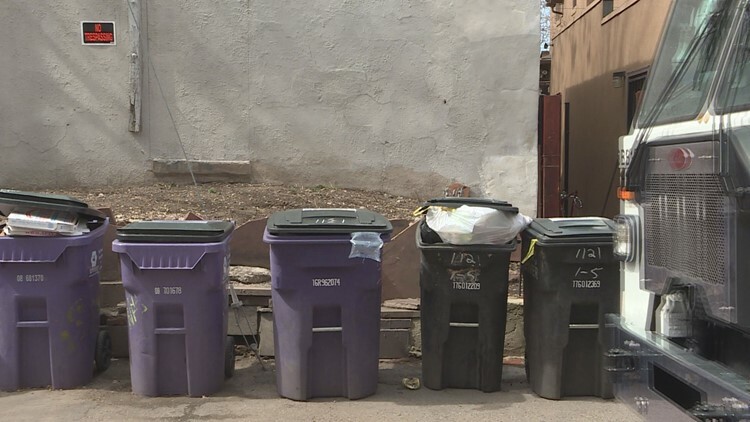 9NEWS: How does Denver's trash pickup program work now? Pitt: In the City and County of Denver, Solid Waste Management provides trash, recycling and compost to single-family homes and homes with seven units or less. How would the pay-as-you-throw work? Pitt: Residents are charged for exactly what they use. ... That doesn’t mean your trash is gonna get weighed. It means that you would most likely pick a size of container that works for your family. Most communities offer three sizes, some offer four. ... Then it would be a monthly fee based on the size of container that you’ve opted into. Right now, if you have a 95 gallons trash container ... that would be considered the largest container, 65 [gallons] the midsize ... 35 [gallons] would be the smallest. Pitt: Don’t know yet, but other local municipalities charge between $20 to $40 a month. What's the benefit of a pay-as-you-throw program? Pitt: Waste is very much across the country considered a utility. ... If someone doesn’t want to pay a high electricity bill – they typically turn their thermostat down in the winter and up in the summer to save money. ... There is an opportunity to change behavior based on your pricing structure, and we don’t have that ability in this city. A lot of time [services] are perceived as being free ... even though they’re not free. That perception is, 'Well we can just put out as much as we want anytime we want.' And we want to change that. Would this new program change that? Pitt: People ... start to look at what they’re putting in their waste containers … A lot of communities see a big influx in recycling and composting. Do people compost and recycle now? Pitt: Denver residents have made an effort to recycle and compost more ... gone from 11 percent recycling and composting in 2011 to 23 percent last year ... reduced more than 300 pounds per household of waste going into the trash every year. Any opposition to the program? Pitt: [The idea] comes up every couple of years, and it’s always a really difficult conversation because there hasn’t been a direct bill for services ... if the city would like to charge, you’re still going from zero to something that has always been funded through your general tax fund. That’s a difficult conversation. Why do you think this should happen? Pitt: Denver is one of only three major cities that doesn’t already charge a direct fee for services.